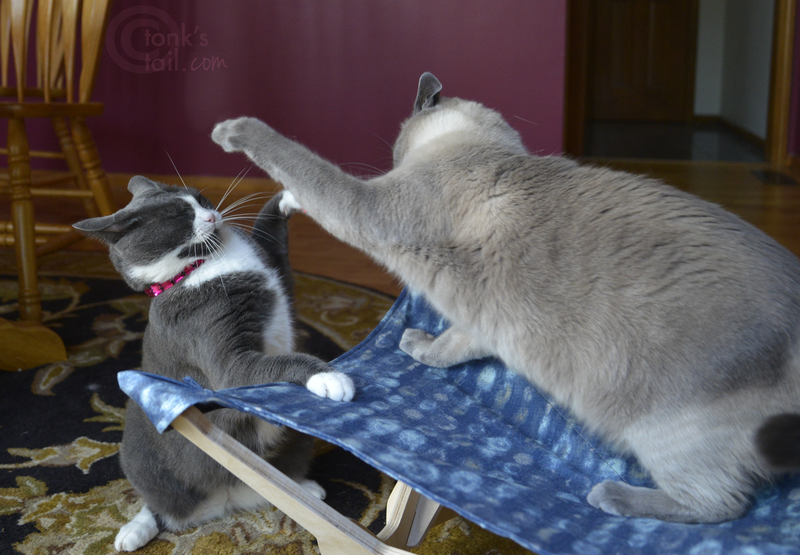 A Tonk's Tail... err, Tale...: Lounger Wars, Episode 1. 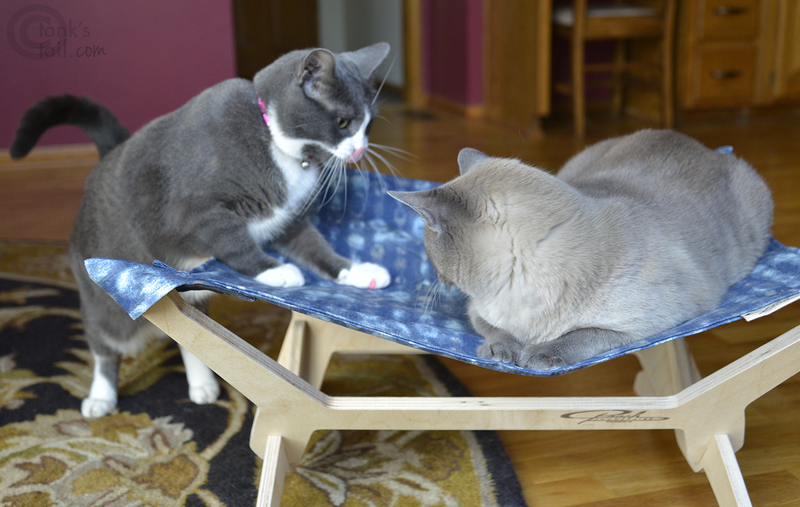 So a few weeks ago we won this pawesome Peach Industries kitty lounger (one for us and one for a shelter) over at Pricilla's blog. Little did we know this had the power to turn mild-mannered Maxwell into Territorial Hoarder Kitty! B-b-but momma, it was clearly for me. It matches my eyes and everything...! Why yes, yes it does. But since when do you refuse to share, Maxie? Allie: That looks really comfortable, Maxie. Mind if I give it a try? Maxwell: Come no further, Allie. Or I won't be responsible for my actions. Allie: Oh please, Maxie. You can stop it with the dramatics. No one's buying it. How will this tale end, gentle readers? Will Allie ever get her turn on the Lounger? Will Maxwell turn into the Kitty of Doom... permanently? You'll have to wait to find out until the next installment of Lounger Wars! LOL we are on the edge of our baskets waiting to see what happens next. Have a marvellous Monday. It was like that over here until the Cattino arrived. Then they fought over THAT. There is no winning the Lounger Wars! oooh...got da bitey on,can yoo press 'paws' for a moment while I go pop some popcorn? Wow, I could see those two on Jerry Springer! 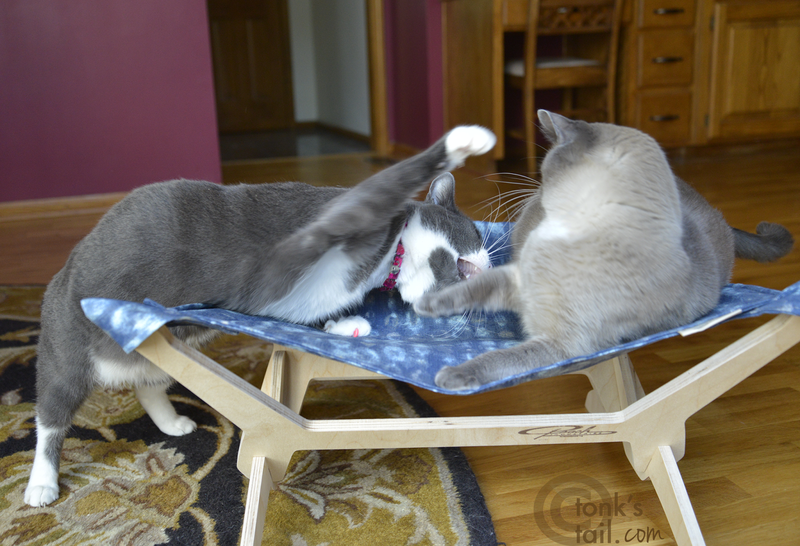 Nothing more funny than watching my kitties fight over something like that! Great! Wow Maxie! I thought you were going to eat Allie for a minute there. Wow, Maxie, look at you go! Watch out, if you get pegged as a hoarder, you might eventually wake up in your lounger with Faraday and Allie gathered around you to stage an intervention. 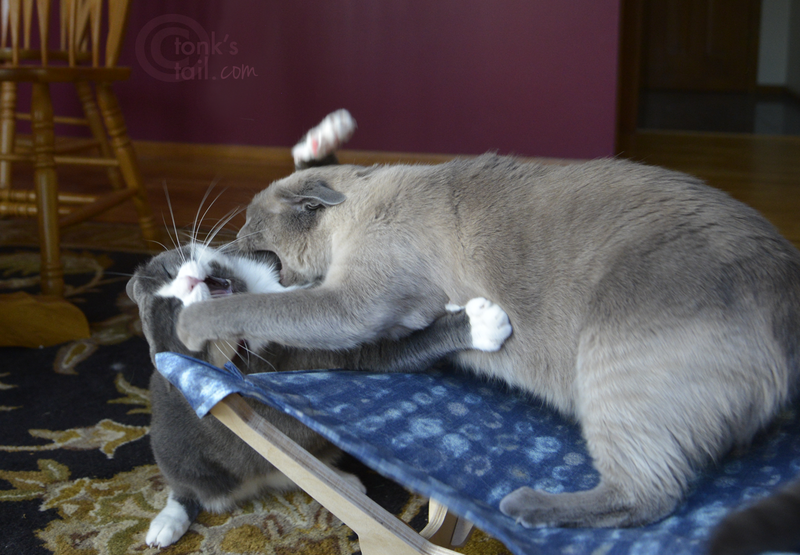 Oh my goodness, you two were really going at it. 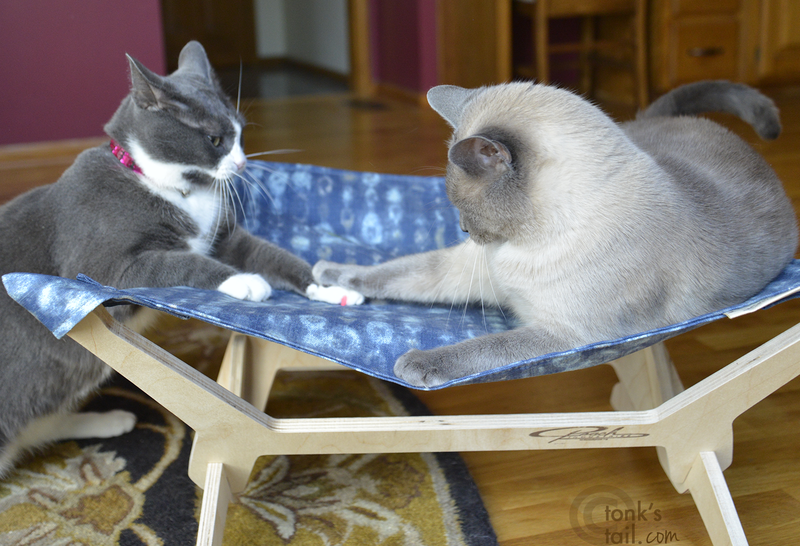 I hope you figure out how to share your new lounger. Funny thing - mom was looking at that lounger last week (she likes the slate color) but decided I'd be just as happy in a free box. JAB WITH YOUR LEFT FARADAY!!! Oh My! That lounger must be the bomb! Maxie you are crazy kitty right now! Hope you don't make Allie too mad! It would be a purrfect time to order yourselves a second lounger - with the humans gone and all. MOL! 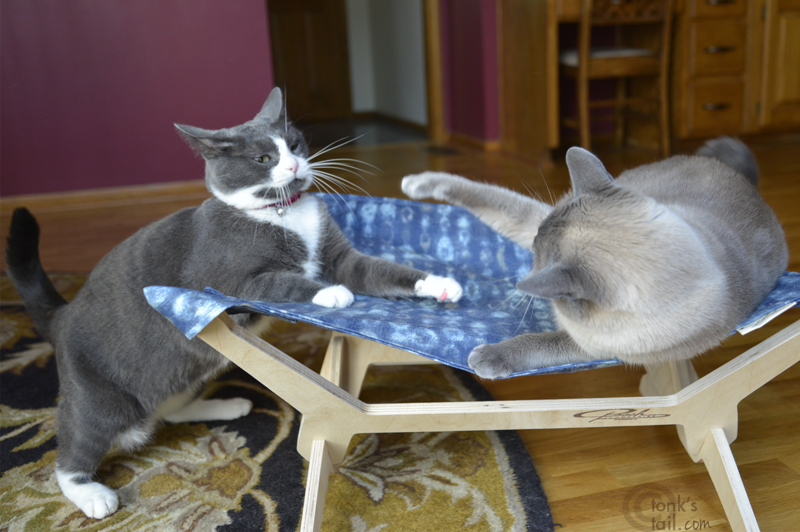 Fantastic Lounger Biffing Battle! And brave Maxwell defends his territory. Go, Mighty Demon, go! Mancats deserve to chill. Wow, it appears that Maxwell means business. That lounger must really be something special! OMC Dat's a meez means business whacky paw. That lounger must be pretty pawesome! Great action shots! These photos are priceless! Great action shots......can't wait to see the next episode of Lounger Wars.....pretty fierce competition that's for sure! WOW!!! Next stop, Madison Square Garden! Well, now, Schatzi would have settled that cat fight for sure by getting a new cardboard box out for them to enjoy hiding in.